Year Six is D O N E.
We’re gearing up for Xtracycle Tree Hauling, year six! We plan to get our tree in the next couple of days and promise to post photos of year six later in the week. Not as cute as when the kids were little and riding on the Snapdeck, but still fun nonetheless. We got a slow start due to the comfy beds and bad hotel TV. 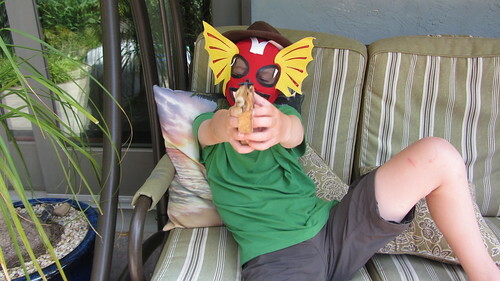 The kids really relish down time in the hotel and it’s hard to drag them away! 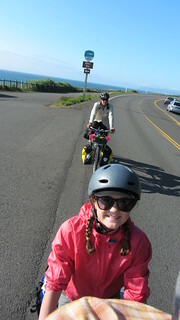 We eventually got on the road and started pedaling towards the Redwoods. We took a short lunch break in Ferndale, a quaint town with shops, cute restaurants and Victorian storefronts. Tim had been holding out hope that I’d agree to do the Lost Coast after reading about Todd’s Brompton trip a few years ago. 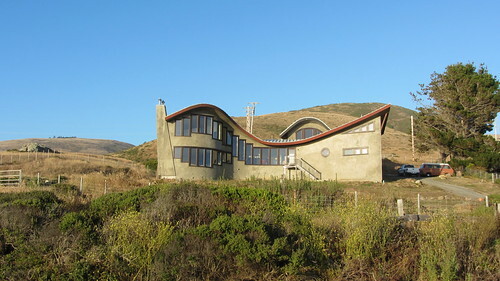 The decision to go to the Lost Coast or not had to be made in Ferndale. I wasn’t feeling that ambitious and we decided to turn left instead of right out-of-town and save the Lost Coast for another trip. Before we left town, we stocked up on chocolate from the artisan chocolate shop, Tim got some dried sausage at the local butcher and we were on our way toward the Redwoods. 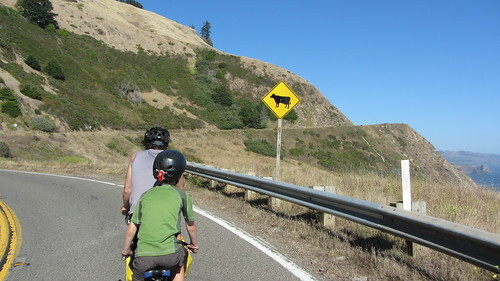 This section of road was pleasant, off highway riding meandering through country roads and dairy farms. 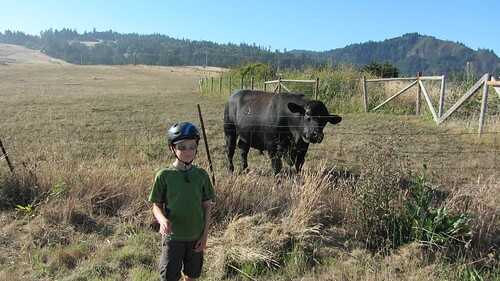 The 9-year-old LOVES cows and really enjoyed seeing so many of them along the way. The route then follows the Avenue of the Giants, definitely a highlight. On a low traffic day, we had the roads mostly to ourselves. Such an amazing experience to ride through a grove of giant Redwoods! 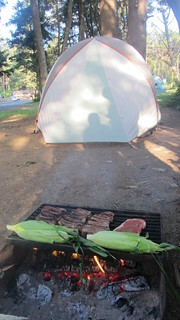 We arrived at Richardson Grove around dinner time, a small pleasant campground right in the heart of the Redwoods. 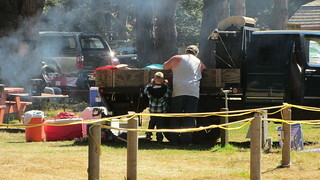 The kids loved the campground, lots of enormous redwood stumps to climb and a small but well done visitors center right in the campground. 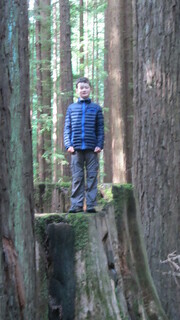 9-year-old boy nirvana, he loves the Redwoods! Low: Didn’t realize there were no grocery stores after Ferndale so we ate some random, bottom of the pannier food for dinner. Tim tuned the bikes in the campground while the kids went to check out the visitor’s center. 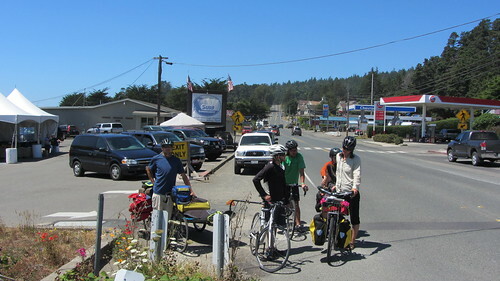 We also met campground neighbors and fellow bike tourists who arrived late the previous night, three college students riding the coast and towing two surfboards! [more about them later in the trip] Ah, the joys of youth. Fun to hear some of their stories from the trip. 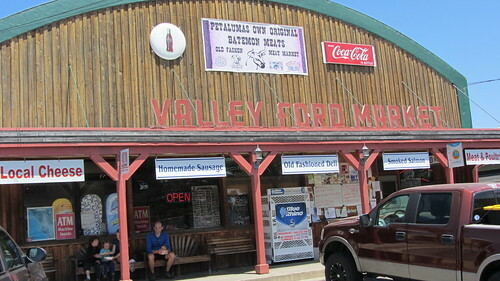 We finally rolled out of the campground in search of lunch in the nearby town. We happened upon the drive through tree, paying the bicycle rate for the privilege of riding through a tree. Kinda cheesy, but the kids thought it was fun! 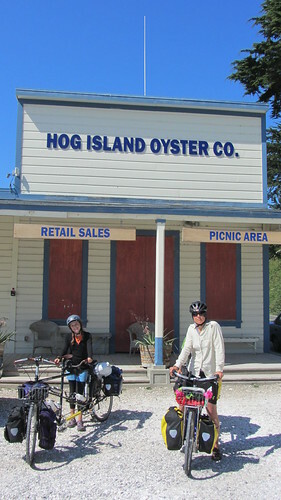 We ate some burgers from a General Store in Myers Flat. The burgers were really good, but the chef must smoke a lot of the local offerings from Humboldt county because it took him forever to cook four burgers! Finally on the road after a big lunch, we spent the day pedaling along the Eel River in the heat. The Adventure Cycling route took us on and off the highway all day long. In retrospect, we should have just stayed on the highway the entire way to save time. The minor off highway detours weren’t worth the extra effort and time they took to navigate all of the highway entrances and exits. We arrived at our destination in Standish Hickey just in time for a late dinner at the Peg House. Maybe we were extra tired and hungry, but this was the best food we’d tasted the entire trip. Bonus that we were greeted by “The Tandem Family” [see below] from Seattle! They were just finishing their dinner and we shared a beer with them while we waited for our food. 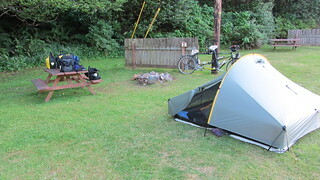 After dinner we pedaled across the street to the campsite and quickly set up our tent and crashed. The campground was filled with bike tourists we’d met along the way. When touring and staying in hiker biker sites every night, you get to know the other bike tourists. And as we learned, everyone has a title. We had already met “The Surfboard Dudes”, in Richardson Grove. 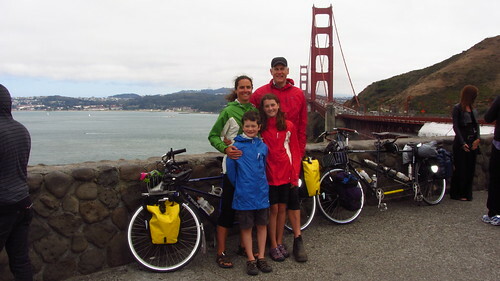 Other bike tourists we met included: “The Cookbook Couple”, “The Tandem Family”. 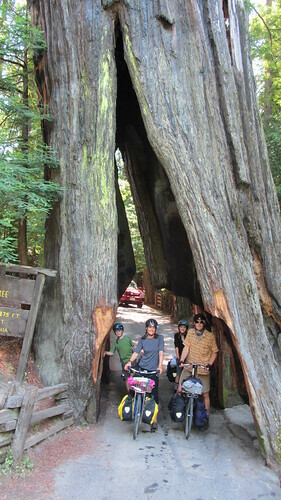 When we caught up to the group in the Redwoods, people realized there were two tandem families traveling the Coast and we became “The Other Tandem Family”. Though we never met them, we anticipated a meeting with the “Russian Vodka Dudes”. We heard they were lots of fun and generous with their vodka. We woke up seriously early the next morning (for us) and packed up camp in record time. We’d planned to have coffee and breakfast burritos at the Peg House before tackling the infamous Leggett Pass. We rode out of the campground to cheers from the other bike tourists, they were all surprised that our family was the first to roll out. They all eventually trickled over to the Peg House and most of them left the restaurant/store before we did, so the cheers weren’t really necessary but certainly appreciated! We’d been hearing and reading about Leggett Pass for a while and were prepared to suffer up the climb. It didn’t end up being as bad as we expected. Shh, don’t tell the kids, Tim and I secretly enjoyed it. 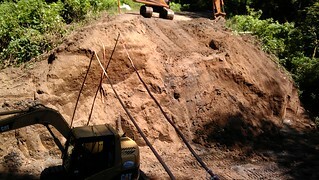 After suffering up the long slow hot climb, we enjoyed the especially fun downhill! We arrived at MacKerricher State Park in the early afternoon. 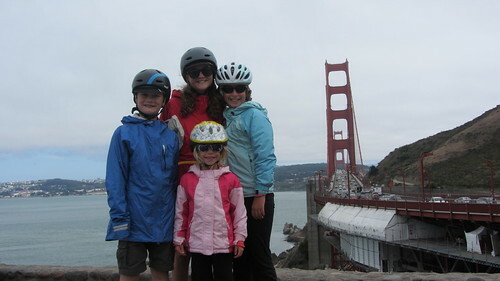 The “Tandem Family” rolled in just after us and we all convened in the way-too-small-excuse for a hiker biker site. 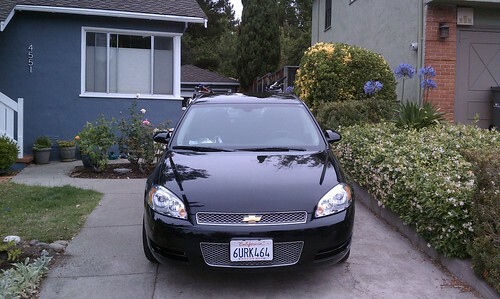 It was really just a car spot that the park designated as hiker /biker. A guy was already set up and using a big portion of the site, and we were pretty sure he wasn’t a tourist, it looked like he lived there. There was also one other tent set up in the site. We decided there was no way we could squeeze two more tents and 8 more people into the site and sent Tim to talk to the park ranger. The campground had extra sites, normally reserved for overflow, and let us move in along with our new friends. The “Tandem Family” and “The Other Tandem Family” in one site! We set up camp and still had spare time for playing on the beach before dinner. A first for the trip and super fun for the kids! 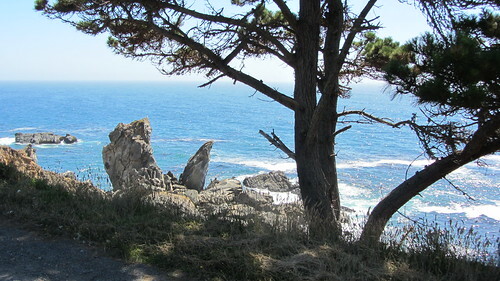 Low: CA State Parks budget cuts are glaringly apparent at MacKerricher State Park. One small hiker/biker spot that is just a car spot they designate for bikes. And dirty bathrooms, yuck, bring your own toilet paper! 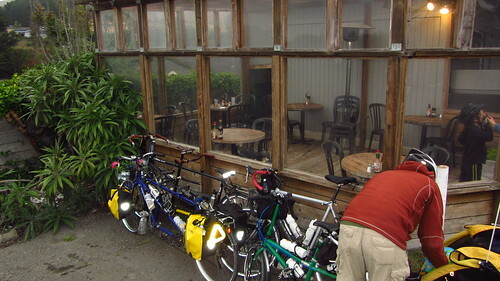 This short day of pedaling started with a long breakfast in Newport, OR. Finding food that all four of us want to eat is sometimes challenging. Someone isn’t in the mood for that, or they don’t like that or any other reasons the choice is bad. But breakfast is easy, we can usually find something on the menu that everyone likes. After breakfast we stopped into Bike Newport looking for kids bike gloves. We struck out on gloves but we did learn that the shop has showers, laundry and a lounge that they provide for touring cyclists. If only we had known! After lingering and chatting with some other bike tourists at the shop, we pedaled down the highway a few miles to the Marine Science Center. We stayed longer than planned, but I just couldn’t pry my science loving boy away. We finally left in the late afternoon, hoping to arrive at the next campsite before dinner. We woke to a heavy damp coastal fog. The laundry we hand washed the night before and left on a clothesline was wetter in the morning than it had been after we washed it. And now it all smelled like wet, damp sea air. After coffee and breakfast, the kids and I wandered over to the day use area so we could walk on the beach while Tim finished packing. Beach time was brief, too cold to linger! 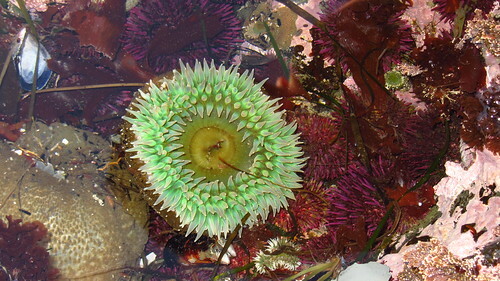 Dip your toes in the ocean, kids, it’s time to get on the road! Thankfully the sun quickly burned off the fog and warmed us up. We enjoyed a fast ride down the coast aided by a nice tailwind. Nothing like looking down at your bike computer to see you’re going 25 with little effort! 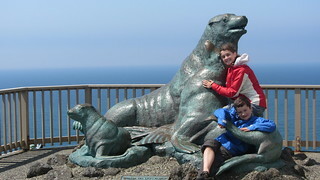 The kids talked us into a tour of the Sea Lion Caves, after seeing all of the billboards on the Highway. A stinky tourist trap that I could easily have skipped but it ended up being a highlight for the boy, so I guess it was worth it. I can still smell the stinky cave and hope I won’t ever have to go back. Sleep: Stayed in a regular campsite at Honeyman State Park. 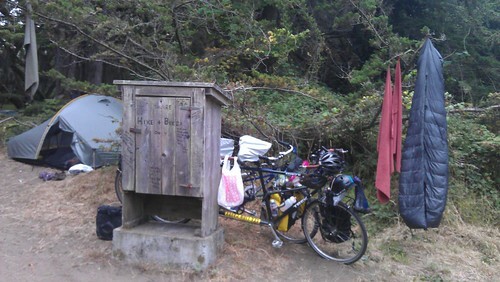 The wet stinky laundry from the day before was still not dry and was now rotting in our waterproof panniers. So we decided to stay at a motel in Coos Bay and do some laundry. The ride to Coos Bay was pleasant enough and uneventful. We arrived in Coos Bay, checked into a motel and set out on foot to find the laundromat. Why didn’t we ride? It would have been so much faster. Not much to say about Coos Bay and after about an hour there, we were wishing we’d planned our motel stay for a better town. We couldn’t find anywhere to eat and ended up eating breakfast for dinner in a roadside Denny’s clone. High: Happening upon a 7-11 on our way out-of-town on Free Slurpee Day! Eager to get the hell out of Coos Bay, we drank lots of coffee in the room, the kids consumed free pastries from the breakfast bar and we made an effort to kickstart our morning. The kids dragged their feet, hoping to prolong bad TV watching on the real bed with pillows. Eventually we convinced them it was time to go, and we were on the road. 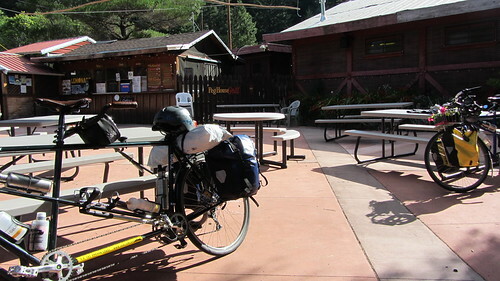 After 45 or so uneventful miles in the saddle, we arrived at our planned campsite for the night. a depressing little KOA off 101. But after a quick tour, we decided to ride 10 more miles to Cape Blanco, hoping to find a more inspiring place to rest our tired legs. 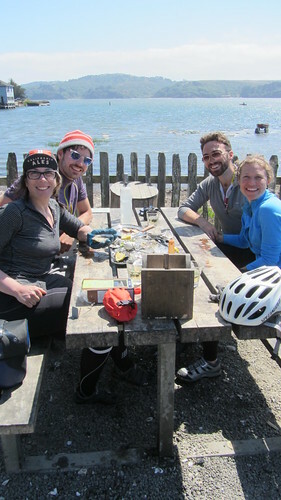 The ride out to Cape Blanco was brutal, we pedaled against a raging headwind the entire way. We finally arrived to find a nice hiker biker area tucked in the trees and out of the wind. A super friendly couple from Austin we had met a few times in campsites and on the road had already started a fire when we rolled in. 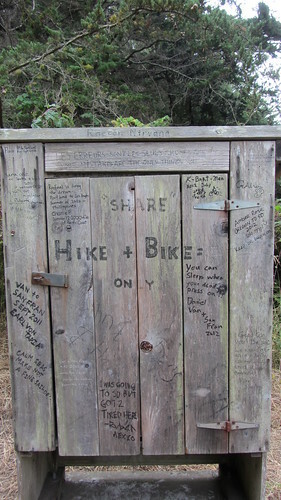 One of the best aspects of hiker/biker sites is sharing stories with all of the other bike tourists. Most didn’t even mind sharing the sites with old people and their kids. Hoping the previous night’s headwind would blow us back to the Hwy, we set out from Cape Blanco with Gold Beach as our destination. 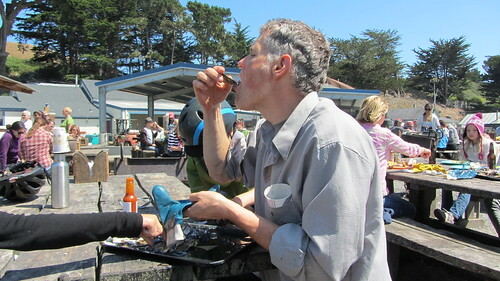 We had decided on a rest day in Gold Beach and were pleasantly surprised when the sun came out and warmed us up. 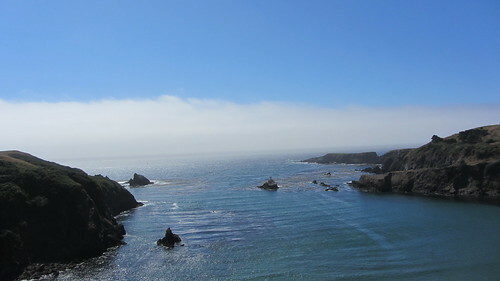 We enjoyed another day of riding with winds in our favor, North to South on the Pacific Coast in the summer is the way to go! 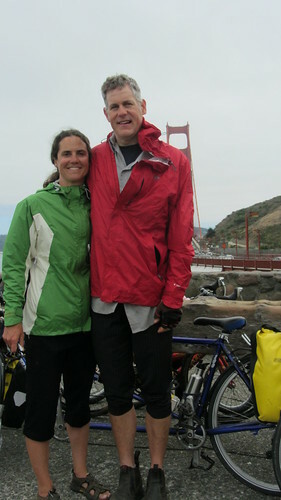 Every couple of days, we encountered cyclists who were riding the Pacific Coast from South to North. One guy riding North told us the headwinds were so bad, that he was only able to ride 20 miles a day. 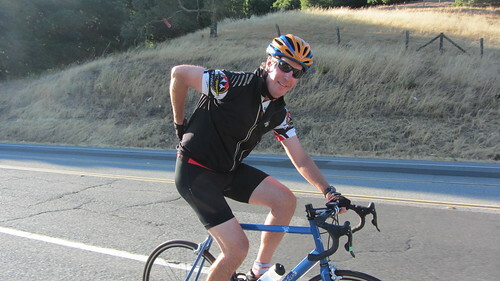 He said often he’d reach the top of a climb, head for the descent and realize he was riding slower on the descent than he had ridden on the climb! The RV park ended up being a very pleasant place for a rest day. The tent area was deserted so we had the place mostly to ourselves. We ate breakfast in the restaurant, cleaned all of our laundry, used the free wi-fi and lazed around in the sun most of the day. But for some reason, I couldn’t sit still. I thought since we were in a beach town we should really go to the beach. I convinced everyone to ride into town and have a picnic lunch on the beach. 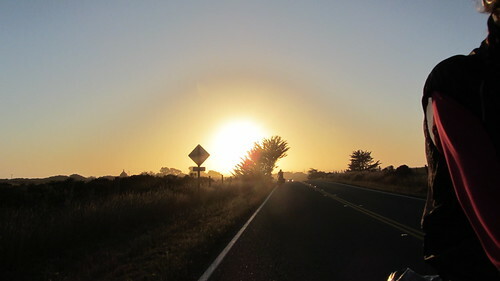 Apparently my short-term memory had blocked out the tail wind that blew us South from Cape Blanco. We pedaled to the beach, pushed our bikes through the sand, our faces getting pelted by sand. Sand blew in our food, and in our eyes, and in our chains. We left after 10 minutes wishing we had just stayed at the RV park out of the wind and rested like we’d planned. 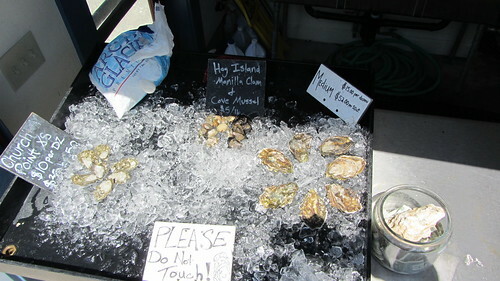 Next up: Gold Beach to Eureka! Thanks, Jorge, for sending us this video! The entire Car Free Days family enjoyed watching this whimsical video that’s a refreshing reminder of the fun involved in leaving our cars at home on occasion!